Equifax reports an intrusion into its system which “may have” stolen the data on up to 143 million Americans, including name, address, SS#, and Drivers license number. This is a terrible lapse in security, and, on paper, it should not have happened. Equifax is a large and profitable company, whose central business is secure, trustable data management and processing. Preventing this type of cyberattack should be one of their most important goals. And yet, it happened. What can photographers and collection managers who use cloud services learn from this? The first thing to learn is that, as stated above, looking at a company from the outside can’t provide a guarantee. It’s hard to find a company that should have a better security practice than Equifax. They are not a startup prone to pivot, or running out of funds, or a company for whom security is a second tier issue. Yes, they make all kinds of mistakes in their reporting, but that’s an inherent part of gathering up trillions of individual transaction reports from many different sources. It’s getting reasonably common to hear that cloud service companies get breached, It happened to Adobe, Yahoo (x3, at least! ), and many more (click the link above for fun). But this does not mean you should just manage all your cloud security yourself. The vast majority of people (and institutional IT), simply have no idea how to fully protect from attack. Cloud services have become essential in the creation, use, storage and management of photos and other media. Unless you are going to go off-grid (start by throwing away your smartphone), you’re going to have to live with a certain amount of risk. The entry points for hacking are exploding. Now your fridge, car, connected camera, and smart lightbulbs can all be attacked by Internet of things (IoT) exploits. It’s going to get even harder to prevent cyberattacks as IoT grows. So our best strategy is to become more resilient. Here are some tips. 1. Centralize all of the media you want to keep. Preserving your stuff starts with knowing where it is. If it’s spread between a phone, your laptop and across half a dozen hard drives, it’s impossible to really manage safely. You can now cheaply buy hard drives up to 12 TB. There is no excuse not to collect everything you want to keep. 2. Keep a local copy of any photos or other media you want to preserve. This means you need a copy of your photo archive on local drives, in your possession. Anything you have that is only stored in a cloud service is at some level of risk, and accurately determining that risk is beyond your ability. 4. Consider write-once media. While DVD and Blu-ray are fading from the media storage landscape, there is still a compelling reason to consider them. Photos stored on write-once media can’t be infected after-the-fact. If you think you have too much data for optical disc, consider the fact that Facebook has built a cold-data archive in North Carolina that employs Blu-ray (for the exact reasons outlined above). 5. If something is really sensitive and it needs to be stored in the cloud, you probably want it to be encrypted on the client side. (This means that software on your computer holds the encryption key, and the cloud service only has a scrambled copy of the data). Note that when I say really sensitive, I mean stuff that is life or death, or has a major financial component. Backblaze is a service that provides client-side encryption. It’s not totally bulletproof, but someone would probably need to know exactly what to look for. Note that an encrypted cloud backup like Backblaze can also help to protect you against ransomware, like the May 2017 WannaCry attack, which is a growing problem. 6. Take a look at the cloud service providers you use. Even though you can’t remove all doubt about your cloud service providers, you can make some educated guesses. Does there appear to be a sustainable business model? Am I paying enough for this service to care about my security? Does a google search bring up anything hinky? If you take these steps, you can help protect the integrity of your photo collection against growing hazards. You may not be able to prevent intrusion, but at least you can recover from it. Once again, it’s World Backup Day! While it’s not as fun as Talk Like a Pirate Day, it’s arguably more important. All of us have important digital stuff that we’d hate to lose. So if the lack of a solid backup plan is something that’s bothering you (even a little), take the opportunity to do something about it. Here are some suggestions. If all your stuff can fit on one single hard drive, then you’re in luck. You can make a clone of your drive. A clone is simply a copy of the drive, written out to another hard drive. It’s really useful if your hard drive crashes. And a clone that lives in a separate place from your laptop will give you protection in the event of loss, damage or theft of the computer. Clones are easy to make, and offer a high level of protection (as long as you update them regularly). I think of a clone as a disaster-recovery backup. As someone who really values my data, I like to keep an extra clone stored offsite, in case there is a fire or theft that destroys both my laptop and my main clone. You can read about making a clone over at dpBestflow.org. I’ve been using this nice little WD My Passport Air for my clone, it’s small, light and durable. It also has built-in encryption so your stuff is protected even if the drive is lost. While I think everyone needs a clone for fast recovery, I’m also a big fan of Backblaze for continuous off-site backup. It’s a real set-it-and-forget-it system. It costs $50/year per computer to make a duplicate of your entire computer up to the cloud. This protects against the threat of total loss of onsite data, as well as any files that have not been backed up to offsite storage. Backblaze is particularly valuable for family members or other who are not vigilant about backing up their stuff. I set up both my daughters before they went off to college, and, wouldn’t you know it, one of them dumped a pitcher of water on the keyboard of her laptop during freshman year. Note that Backblaze is not really designed for large image libraries that many photographers have. You can also use a photo-oriented service for backup. If you are a PhotoShelter customer and you use Lightroom, you can automatically publish images to the cloud. I have mine set to publish high quality JPEGs from all 4 and 5 star photos. Lightroom’s Publish Services can be used to backup images to the cloud mostly automatically. This can provide a current JPEG (or original file) backup that is updated as new files are added to the catalog. If you have a lot of data like photos and videos, you might want to get some big drives for backup. WD is now shipping 6 TB drives that are about $250. That’s a heck of a lot of data in a small package at a reasonable price. There’s no excuse not to keep those photos backed up. (Back them up twice if possible – once on-site, and once off-site, for a total of 3 copies. Here’s a really economical way to backup files. Get a bare drive and a “toaster”. You don’t want to use the toaster for everyday use, but they are great for backup. It’s easy to be overwhelmed by all the considerations that go into a perfect backup system. So don’t try to be perfect, try to be better. If you don’t have a clone, get one. If you travel a lot, then online backup may be a good addition. And if you have only onsite backup, consider adding an off-site. Each time you make an improvement to the system, you add more protection, and reduce the chance that you’ll lose important data. I’ve recently been working a bit with the folks at WD. They have sent me some equipment to evaluate, and they sponsored my last talk at PhotoPlus Expo. And a few weeks ago I went to a Product Summit in Laguna Beach. I still have to buy most of my own hard drives, and I’ll typically buy WD when I’m spending my own money. I have also been working with PhotoShelter to create a new service for people who buy photographs. Again, I’m working with a company I really believe in, because I really believe in them. The competition to provide you with cloud storage is starting to reach a fevered pitch. It’s now possible to add excellent cloud backup to your storage system for a very reasonable cost. Some of these costs remain artificially low, and may therefore not be reliable in the long run. But we’re also seeing the big players in computing (Google and Amazon) offering really low pricing. We’ve seen some low-cost options for years. This includes services like Carbonite and Backblaze that have claimed “unlimited” storage for prices around $50/year. This means that someone like me with a dozen terabytes of data will be a money-loser for each of these companies. I’ve always been distrustful of these plans, fearing that the companies will go the way of Digital Railroad, which shut its doors with little advance notice in 2008. Carbonite gets around the super-user problem by limiting the cheap backup service to your internal drive. As you add external disks, the price goes up. (Let’s also take a minute to note that Carbonite does not forecast profitability anywhere on the time horizon, which is problematic.) Backblaze does allow for truly unlimited data, and explains their strategy by saying it will average out between low and high volume users. This is okay for backup, as long as you realize the service may go away someday, and it’s not your only backup. Last summer, Amazon rocked the world of online storage by offering a new cloud backup and archiving service called Amazon Glacier. The price for the service came in at 1/10th of Amazon’s regular S3 pricing. You can now store a terabyte of data in Amazon’s cloud for $10/month. This one is a game-changer. Amazon is the 800lb gorilla in cloud service, so the prices that they set will determine what the rest of the market does. Amazon Glacier is positioned as a real backup or deep archive solution. They say it may take up to 5 hours to access the data, so it’s definitely not a place to store stuff you expect to access frequently. But it does promise great safety and reliability from a blue-chip company. A few weeks ago, Google matched Amazon’s bet, and even raised it. Not only did they match the $10/terabyte/month price, they made the offer on Google Drive. This means that Google is offering the price on storage that is always on, not just a backup service. While Google will probably lose money on this specific service, it’s part of a larger strategy from the tech giant. The real competition at work here is not about collecting money for storage. The real competition here is to become the universal shared storage system which can work across all your devices. Dropbox has been the category killer for this service, seamlessly sharing between you, your friends and coworkers, your computer(s) and your phone. It has been able to do this where Apple (and others) have failed numerous times. Dropbox has rocketed up in value, and is poised to become even more valuable. The companies that become successful in creating a shared filesystem are well-positioned for long-term success. This kind of engagement is hard to pull away from, since you build it into your collaboration and your fundamental relationship with your own media. In The DAM Book 3.0, I’ll dive into the use of cloud storage as part of a DAM strategy. This new development in pricing and strategy offers some excellent value for photographers looking for storage, backup and sharing services. Every hard drive is out to get you, (but some more than others). I’ve used that as a laugh line in my lectures for a bunch of years. Whenever people ask me which drive to buy, I point out that even the best quality drive can experience a sudden failure. But you can lower your odds of a problem. Backblaze is a company that buys drives by the truckload. And they buy the most cost-effective drives they can. They are nice enough to publish the failure statistics for specific brands and models. Last week, they released a round of these numbers, and provide some good context for them. This graph is from an article on the Backblaze blog that outlines the failure rate of various drives they use. 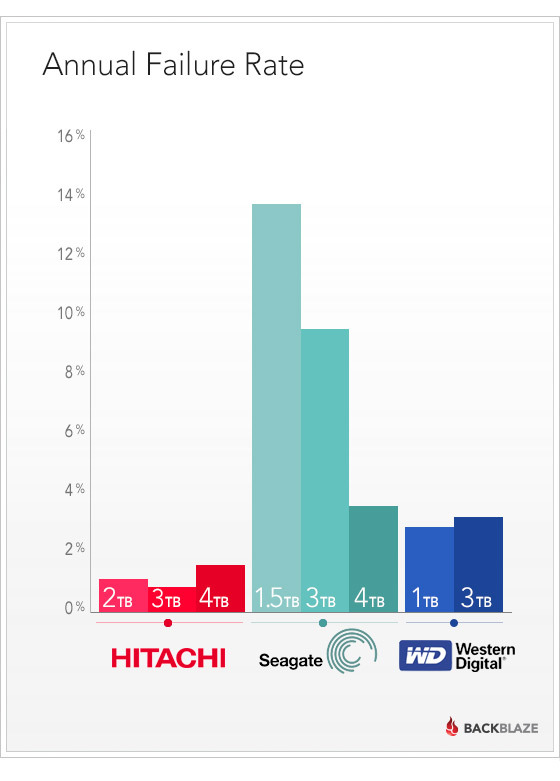 The short answer is that Hitachi drives provided the best reliability for Backblaze, and Seagate was the worst. In the case of the Seagate 1.5TB drive, the numbers are really bad. I’ve been buying (and recommending) Hitachi drives for a couple years now. Good to get a little more empirical evidence. BTW, I like Backblaze as a cloud-based backup service. I don’t use it for my own work, because I have things taken care of locally. But I’ve installed it on the computer my daughter has taken to college with her. It makes a cloud backup in the background as she adds or changes files. Each of these workflows has a dedicated chapter outlining the goals and how to achieve them. The following video helps you understand what each of these configurations includes.